As used by Rongsheng E. Wang et in 2015, the S-4FB linker can be used to generate antibody conjugate HLCX-dasatinib (doi:10.1021/jacs.5b00620). Since that first step, more improvement were made. 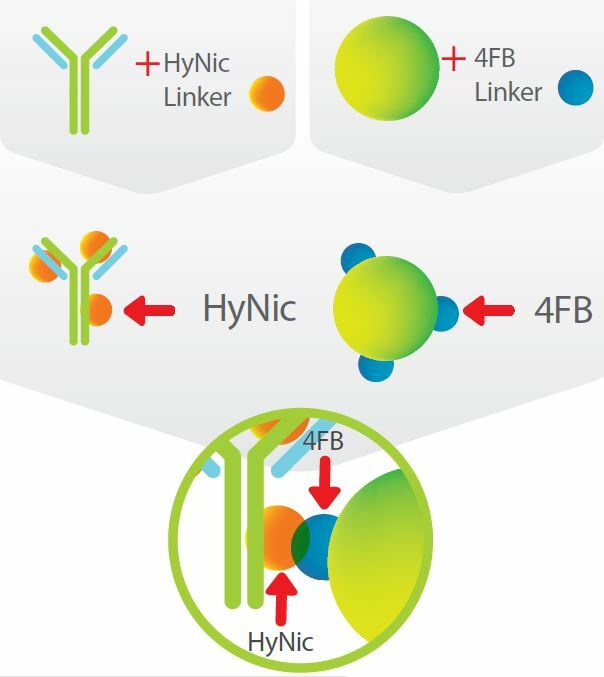 Indeed, we can combine the S-4FB to HyNic-biomolecules. The conjugation is simple, rapid and stable. Trilink Biotechnologies provides that technology under the label ChromaLink. The principle is illustrated on the picture below. There is also a cleavable S-4FB linker and a MHPH (Maleimide HyNic) crosslinker for maleimide-based ADCs. So it allows also drug conjugation to oligonucleotides such as aptamers for another type of cell targeting. Interested in learning more? Leave your questions or comments below, I’ll be pleased to answer!